What is Art and Why do we make it? the top of the outer circle. Draw a single stroke line from the top of the leaf to the centre of the circles. Select the leaf and line, group (Ctrl/Cmd+G), copy it and paste it in front. 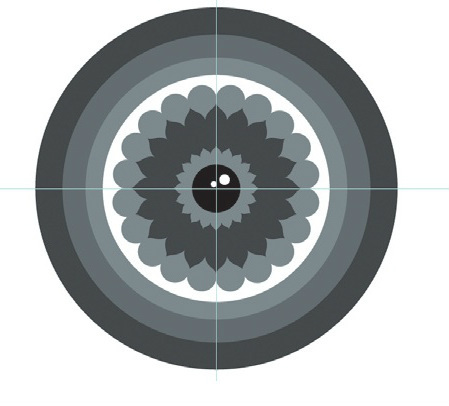 Select Transform>Rotate>18° and position the end of the stroke line at the centre of the two circles. Repeat around the circumference and remove the lines. a largecircle of the same colour behind to fill in any white space. and positioning it behind the small black circle. Add some white circles inside the black circle for detail. Copy the black circle. Paste the new version behind the original, select it and go to Transform>Scale> 470%. Fill it white, then add three more rings this way, colouring them light to dark. Draw a white teardrop shape, and use Object>Arrange>Send Backward to help position the shape on the same level as the white circle. Now draw a black eyebrow with a white stroke line. Select the Circle tool, then draw an oval behind all the other elements. I fill this oval a light grey. With the Direct Selection tool, move some of the top anchor points so they are behind the eyebrow. 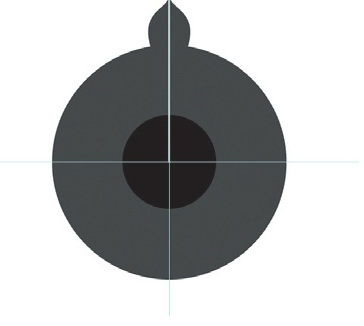 the Pen tool, draw a path from this circle to the black circle, up to the eyebrow and back down to the circle again. Fill with grey. Drag a guide to mark your last line down to the circle. Select the Rectangle tool and draw a shape that will act as the jaw. Select the Circle tool, make an oval shape, then draw another shape with the Pen tool that leads from the oval to the central guide. Make another circle, place it behind these elements and, with the Scissor Tool, trim the circle down to a lower-left quarter. Reflect>90° and align the new set of elements opposite using the central line as a guide. You may need to tweak some shapes. will need to pay attention to the arrangement (Object>Arrange) of your elements once you have added them using the Pathfinder palette. color in the tool bar to Stroke Only, choose Effect>Path>Offset path and set to 2mm. Hit OK. Now choose Object>Expand Appearance and add a white fill. Now draw a large white circle with a black stroke line to form the scalp. Use the Rectangle tool and stroke lines to create some detail. Add a tongue by combining a rectangle and a circle and arranging this new shape in front of the black fi ll of the mouth. Draw a new leaf shape using the central guide to create symmetry. Set Fill to black with a white outline. Copy this and paste in front, selecting Object>Transform>Scale 40%. Place the two objects on the outer edge of the tiger’s head and follow the line around in two rows. You might want to try adding more depth and tone to the elements of the composition by using gradients of colour. Using both Radial and Linear fi lls, you will fi nd that you can create the illusion of 3D. Now group the two rows, copy and paste in front selecting Object>Transform> Reflect 90°, and position on the opposite side. Now add the ears using the same process – draw, scale, rotate, reflect, position. Now go to Window>Swatch Libraries>Patterns>Basic Graphics and open both the Dots and Lines swatch palettes. Experiment but be sure to add pattern to a copy of the fi lled objects, as patterns are transparent. Now make new shapes within your existing composition. Add opposing pattern structures and switch between lines and dots. You can also add more detail with the Line tool, and add more shapes. The important thing here is to get creative and experiment.